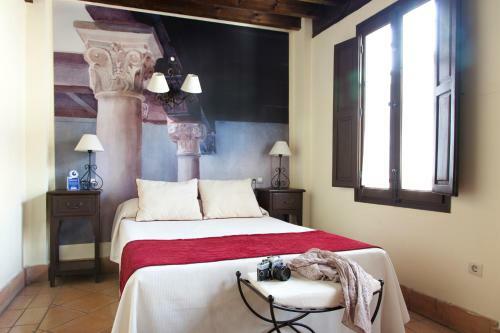 This boutique hotel is located in Albaicin, a short walk from Royal Chapel of Granada and the Madrasah of Granada. The hotel has 17 rooms and has been recently refurbished. The hotel also offers meeting rooms, a 24 hour reception and a secretarial service. Babysitting / child services, multilingual staff and a concierge are also offered at the hotel. The Hotel Casa del Capitel Nazari offers large and comfortable rooms equipped with a hair dryer, a telephone and a mini bar. Rooms are also equipped with an internet connection. Guests can wake up to a gourmet breakfast, which is available on request every morning. Located close to a number of popular hot spots, the hotel is in close proximity to lots of bars, nightclubs and trendy restaurants. Granada Cathedral is within a quick 10 minute walk of the hotel. This hotel is 1009 metres from the Alhambra entrance, 193 metres from Plaza Nueva (the absolute centre of Granada), 1627 metres from the train station and 2964 metres from the bus station.